My thoughts will probably be scattered on this one, so bear with me. I'm a member of an incredibly special support group on Facebook, called Heart Mamas. Across the country and around the world, moms with babies of all kinds of congenital heart defects come together and exchange advice and support for each other. Sometimes, inevitably, a child passes away. Learning that a heart family has lost their fight is always incredibly saddening. Last night, a baby girl named Addison lost her fight with HLHS, the same condition Jonas has. She was 3 years old: The same age as Jonas. She was healthy going into the third and final stage of the procedures that almost all HLHS kids undergo to repair their hearts to work at the best of their ability. She had the Fontan procedure, (Which Jonas is still about a year away from)and it didn't take. Within a very short period of time, she received a heart transplant. She was discharged to Ronald McDonald house and all was looking well, until she came down with a high fever and infection. Unfortunately, things quickly took a turn for the worse, and she passed away. My heart aches for this family. Just when it seemed like things were looking up, they lost their precious little girl. As I sit here in bed with Jonas, watching him snuggled up on my pillow (That's almost as big as he is)I can't help but be SO THANKFUL. And also afraid. While it's true that any of us can go at any time, the threat for us is all too immediate and far too real. This little girl's story hits so close to home, because we're not in the clear yet. To be honest, we're never going to be. There is no permanent fix for HLHS. All we can do is hope for the best, and cherish every moment in the meantime. I can't live every day as though the end is near, but I must never take for granted how lucky I am to have the precious gift of this boy in my life. I will love him with everything I have, and teach him to be the best he can be, for as much time as I am given with him. In true 3-year-old fashion, he'll wiggle and squirm when I squeeze him too hard and kiss him more than he'd like. And I'll smile and laugh as he giggles and tries to run away, because these are the moments that matter most. On Saturday, September 29th, I scooped a sleeping Jonas from his bed in the early morning hours. 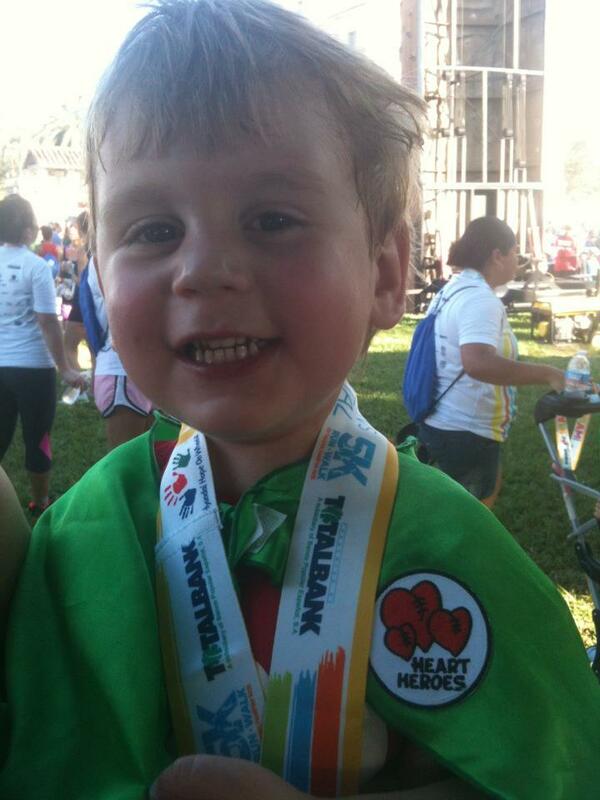 We had a long drive to Coral Gables for the Miami Children's Hospital 5k Walk/Run. 10 of us became "Team Jonas" for the day, raising over $600 for the hospital and taking on the 3.1 mile challenge. For some of my friends, this was their first 5k. They made the effort to register and participate because they love my little boy that much. For others on the team, they reached their personal best time. Jonas and I took the path at a medium pace. I pushed his stroller and chatted with Joel, who decided to stay with us for most of the walk. I wasn't trying to break any records. I don't have a jogging stroller, and I've been advised not to put too much strain on my already less-than-whole kneecap. Jonas was a trooper, never once protesting about the long walk. He enjoyed taking in the pretty trees and sprawling houses in the neighborhood. He'd ask where some of our faster friends were, and I'd answer that we'd see them at the end of the race. We arrived at the finish line at 1 hour plus a few seconds. As soon as we finished, officials were organizing the first wave of the Kids' Race. Kristina and I left Joel with Jonas's stroller and walked him over to the "Start Line". We each held one of his hands, feeling the excitement radiate from my sweet boy as he ran as fast as any child with a whole heart. He was running carefree, full of joy, and so much of this was because he was treated with such skill and heart by the professionals at the hospital we were running for. Jonas crossed the Finish, and a little girl was waiting with a medal that seemed to weigh as much as he does! He was so proud, he talked about racing for the rest of the day. We stayed for an hour or so after the race, chatting with our team members to see how their run went. Jonas played on the inflatable playground and bounce house until we had to coerce him out because they were packing up for the day. The event was sponsored by the radio station Luis works for, so we spent some time at their booth as well. It was a great day surrounded by friends and love! Jonas, Luis, and I piled into the car on Thursday morning, August 16th, for our trip to Miami Children's Hospital. After weeks of playing with rubber gloves and shoe covers, and calling himself "Dr. Jonas", he was excited to go. We checked in without hassle, and made our way upstairs for pre-op. We discovered the team was running behind schedule with the patient ahead of Jonas, so we busied ourselves with toys and crayons in the waiting room. Eventually the anesthesia nurse came in, administering Jonas with "silly juice". He loopily swayed back and forth, saying "woah, woaahhhhhh" and slumping over in his dad's lap. True to form, I heard him chatting away to the nurses as they wheeled him down the hall, asking which direction they were going next. Luis and I left the hospital for lunch, as we'd skipped breakfast in solidarity with the kiddo not being able to eat. The echocardiogram and catheterization take a total of 3 hours to perform, so we went to the mall and did some browsing to kill time. We attempted to lighten the mood with a little game of air hockey, in which I lost horribly. Updates came via telephone every hour, until we drove back to Miami Children's at 3:00p.m. to wait for him to return from the recovery area. Half hour later, Dr. Khan spoke with us about the minor repairs he made. Jonas's heart condition lends itself to abnormal lung arteries, which Dr. Khan repaired with collateral occlusion, inserting two coils into Jonas's lungs to improve circulation and blood flow. He showed us the scans of Jonas's heart and lungs, which look fantastic for a child with a congenital heart defect. There is just one minor narrowing of an artery, not narrow enough to cause concern. It was explained to us that the final step of his heart repair is put off until he reaches 30 lbs. because (unlike previous repairs that utilize existing tissue) the 19mm tube that is inserted into the inferior vena cava will not grow with him. The tube must function just as well when he reaches 150lbs. as it does at 30lbs. Because Jonas is slow to gain weight, (as are the majority of people with CHDs)he will likely be 4 years old, possibly closer to age 5 before the Fontan surgery. After meeting with Dr. Khan, we settled into a private room. Jonas awakened groggy and upset, yelling "Nooooo, I wanna get outta here! I wanna go home!" After some cuddles and reassurance, he'd fall back asleep for half hour or so before repeating the process twice more. He finally stayed awake, watching "The Muppet Movie" and happily devouring a popsicle and some Gatorade. As the evening wore on, he repeatedly asked to get out of bed and play with his cars on the floor. It was difficult to make him understand that he had to keep his leg straight (6 hours total) post-procedure. We wrapped his lower half in blankets, trying our best to keep him still and distracted. Around 7:30 he feasted on chicken nuggets, fries, carrot sticks and apple sauce. By 9:00, Kris had left and Luis and I pulled out lounge chairs, scooting them side by side to watching "Breaking Bad" on the laptop while Jonas started "Cars 2" for the third time in a row. A nurse came in periodically to check his blood pressure and oxygen saturation levels. Around 11 we all fell asleep, virtually keeping to our regular routine (Save for Jonas falling asleep to television, which does not happen at home). He only awakened once during the night, at 4a.m., asking for a hug from mommy. By 7a.m., a new nurse had arrived, and we were up for breakfast with "Cat in the Hat" and "Curious George", again sticking to the usual routine. Jonas was in a great mood, and finally able to get out of bed. We unhooked him from his blood pressure cuff, and he played with cars and legos on the floor for a few minutes, until it was time to go for an x-ray. The x-ray went quickly, and Jonas was happy throughout. He followed directions well: Hold up your arms, look at mommy, turn to one side. Back in our room, the residents came by for rounds. They asked me some basic questions about Jonas and his condition, surprised that he had no other complications or health issues. They noted that he is extremely verbal and alert; and, despite being small for his age, he's a fighter. 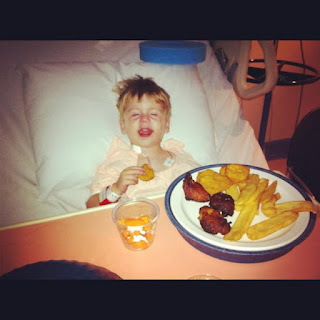 We spent time in the playroom across the hall from his room, awaiting discharge papers. By noon on the dot we were signed out and ready to go, and what a relief! Just another adventure with the boy with half a heart. It's good to be home, and back to "normal", despite Jonas having some residual back pain, and a fear of having band-aids ripped off. I surprised myself by remaining in a good mood. I never got anxious or cried, and Luis kept me in good spirits by being so supportive and loving. Being able to stay with Jonas overnight made all the difference, I knew how he was doing and that he was nearby. It's that time again. Tomorrow, Jonas will be 3 years old. When I'm snuggled up in bed with him, watching Yo Gabba Gabba on the laptop. When I'm counting to 3 because I've already asked him several times to do something, and it's the only way he'll listen...because when I make it to 3, I'm holding his hand and guiding him to do it anyway, and he's much too independent for mommy's help. When he's singing the alphabet, because no matter how many times we go over it, he still skips the letter "E", and says "KIM" instead of "K-L-M"
When he makes me take him to the potty in public, just to circle the toilet 5 times, sit on it and not actually go, but still wants to flush. When he tells me: "I love you, mommy. You're my best friend, and you're awesome"
I have a thousand Jonas stories and memories in these 3 short years. I store them up in my brain the best I can, because they are precious moments with a child I couldn't be any more lucky to have. 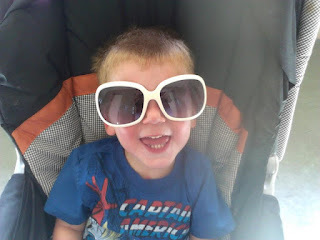 He's the sweetest, most easygoing, loving child I've ever known-and I'm not just saying that because he's mine. He's a ray of sunshine, even when he's got a grouchy look on his face. We made a trip down to Miami Children's Hospital yesterday, for pre-surgical orientation. A woman sat with a small group of children and their parents, explaining to us in kid-friendly terms what to expect during our upcoming visit. Jonas played with a toy thermometer, stethoscope, and blood pressure cuff. We were given a tour of the pre- and post-op areas, as well as the waiting room, and the recovery room on the cardiac unit where Jonas will be staying overnight. This was a really positive experience for him. 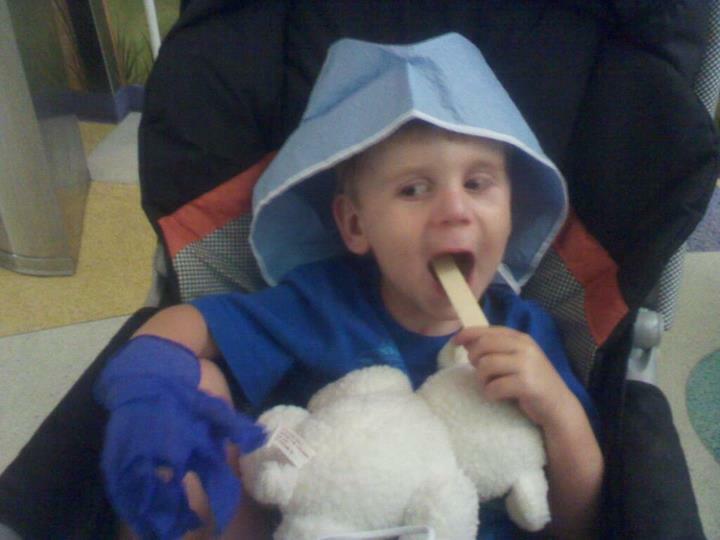 He was sent home with his very own "Dr. bag", filled with mask, cap, tongue depressor, and other goodies to play with. He had fun playing dress up, calling himself Dr. Jonas. I know it will be different for him on Friday, when he's there as a patient, instead of a visitor. Returning to Miami Children's was a flood of emotions for me. I recounted our previous experiences to the guide, lump in my throat as I detailed our visits and his first two surgeries. As we rounded the corner to PICU, I was triggered with the memory of watching him being wheeled away for his first surgery. Just four days old, Jonas was being taken away from me. I pushed through the memory of my whole body heaving with tears, unsure of what would happen next. Friday's cardiac catheterization is a minimally invasive procedure. He's had it done before. It's not as bad as open heart surgery. This is all very logical and rational, but it doesn't stop the fear and worry. It doesn't quell the anxiety. I don't want Jonas to be afraid or in pain. I can only do so much to protect him. I will be by his side every step of the way. No one should ever have to go though multiple procedures, especially not a child as loving and amazing as my own. Today, we're going to snuggle. Watch cartoons. Blow bubbles. Because these are things I can control, and enjoying our time together is the best way to destress. Having a conversation with a toddler is sometimes confusing, but always entertaining. It goes without saying that I like to talk. 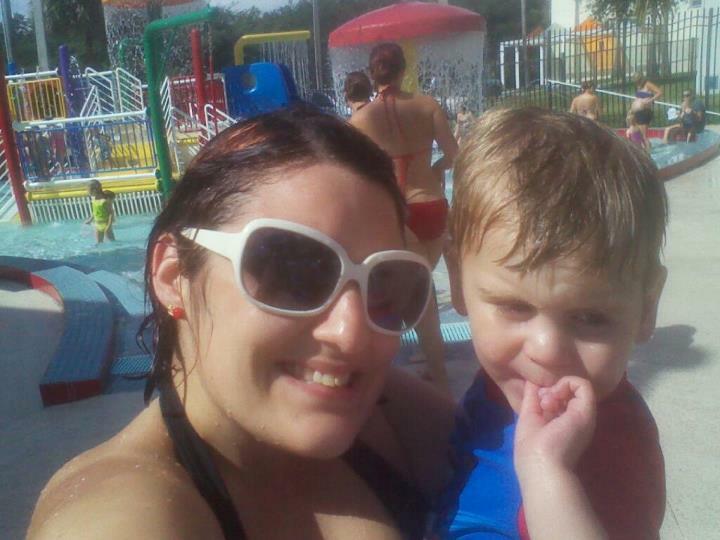 It stands to reason I'd bring a child into this world that talks as much as his mommy. The most interesting thing to me is observing how he chooses to communicate, and watching his memory develop and improve. He'll say things to me that are seemingly out of the blue, but he's probably been gathering the information for days. Earlier this week, we were walking from the car to the house. Jonas turns to me and says: "Mommy, Curious George with the butterflies". A week ago, we went to the butterfly garden at Secret Woods in Fort Lauderdale. It was only after we'd gotten back home that I realized we'd lost old George in the garden. I could picture him sitting on the bench, all alone. I explained to Jonas that Curious George stayed to play with the butterflies. Little did I know it would stick with Jonas, resulting in him talking to me about it a week later. Last night, Jonas decided to sing everything he was speaking. On a talkative drive home, he started by singing about Luis being at work. (One of his favorite Jonas Originals, second only to Dinosaur, Dinosaur). "LU-IS at worrrr-rrrrk" he sang, before switching gears to: "Mommy ha-home, mommy go home. Cooby Doooooooo, dark outsiiiiiiide...go playground laterrrr. Go playground sooo-oooon"
I'm sharing this with you, because as I am experiencing this stage of a child's development for the first time, I am absolutely fascinated with a toddler's train of thought. It's something akin to stream of consciousness. Whatever is on Jonas's mind, he just blurts out loud. Being a parent is like getting an education in real time. The way our minds work, why we behave and react to things in a certain way, and how we process information. I am learning the best way to teach and communicate with Jonas, just as he is learning the best way to communicate with me. Last year, on one of my mom's random visits to South Florida to spend time with her grandson, she brought Jonas a copy of Follow That Bird. If you're a child of the 80s like me, you remember this tale of Big Bird and his cross country journey of family and acceptance. Jonas immediately fell in love with the movie, and (like any good toddler that's fond of a routine) wanted to watch it on a loop. Fast forward several months, and we're on a car ride. I could hear him singing in the backseat, so I turned down the radio to hear if he was just chatting to the song. Much to my surprise, I hear him singing one of the songs from the movie: "Eaaasy goin'. Laugh...cares...way. Easy goin' day". What a fitting and appropriate song to be one of the first he learns. Jonas's life may have started far from "easy goin'", but strangers and friends alike often remark on what a happy child he is. I try my hardest to remain positive, especially when it comes to Jonas's health. He recently had a bi-annual check up with the cardiologist, and the weeks leading up to it were absolute torture for me. Jonas is not "sick" by any stretch of the imagination. But he does need one more surgery to complete the re-routing of blood flow from his heart to the rest of his body. Many kids with Hypoplastic Left Heart Syndrome have the final surgery, called the Fontan, as young as age 2. I was dreading Dr. Flores would at least want to schedule him for a catheterization, to see how his function was holding up. I am ecstatic to report I was just being a worrisome mommy. Dr. Flores assured me that Jonas was extremely healthy, and she wanted to wait until he was 4 years old to schedule the last surgery, as long as he remained in good health. Jonas climbed up into the chair next to me in her office, and she remarked: "Look at how fast he climbs! I know heart healthy children that aren't as fast as he is!" This visit was exactly what I needed to calm my fears. I know the final surgery is inevitable, but to hear Jonas is doing so well is reassuring. Jonas has endless amount of energy. He is a daredevil risk taking toddler, with not a care in the world...which is exactly as it should be. I am just so afraid at times. I guess this is normal for all parents, to be (sometimes obsessively) concerned about their child's health and safety. I try not to get ahead of myself. It's important to take this one day at a time, because looking into the future is stressful and frightening. For now, today, Jonas will laugh and play. He'll tell me stories about the cats, request his favorite albums (Weezer's Green album and Joel DaSilva and the Midnight Howl) and get a quarter of the way through the alphabet, not realizing his skips the letter "E". I just have to remind myself to live in the moment, and enjoy each precious hug and kiss from the sweetest boy I know.